“Wait right here,” Mr. Imagination says before ducking back into the dark, art-choked living room of his compact ranch, in the northwest Atlanta neighborhood of Riverside. The renowned visionary artist emerges into bright sunlight with three blackened sticks and a reverent smile. With the air of a weathered rock star — black beret, lots of silver rings, a goatee he sometimes braids with copper wire — he looks barely 50, much less 62. The man whom Rebecca Huffberger — founder and director of the American Visionary Art Museum – calls “one of the supreme practitioner of visionary art” in the world has earned a reputation as a genius of creative reuse, deeply original, highly prolific, a model of perseverance. His works have traveled the globe and landed in permanent collections at the Smithsonian American Art Museum and the American Visionary Art Museum in Baltimore. While Atlantans may recall the 11-foot Coke bottle he decorated for the 1996 Olympics, or have seen one of his large installations at House of Blues locations in Las Vegas, Chicago or Orlando, they may not know he moved here just over two years ago, and makes his grand local debut in a show at Barbara Archer Gallery on Feb. 17. With it, the much-loved artist who defies most self-taught artist stereotypes — he’s from the urban North, a seasoned networker and famously gregarious — hopes to let the art world know he’s back, stronger than ever. For while he’s made a nice living in the transformation business for decades by taking the castoffs of others — industrial sandstone, old bottle caps, paintbrushes, wood and cement — and turning them into big-ticket works of art, these past few years have challenged even his relentless optimism. His latest body of work isn’t so much centered around reclaiming what others had thrown away as it is salvaging what pieces of his own art survived a devastating 2008 house fire — and finding new life in them. It was three years ago last month that Gregory “Mr. 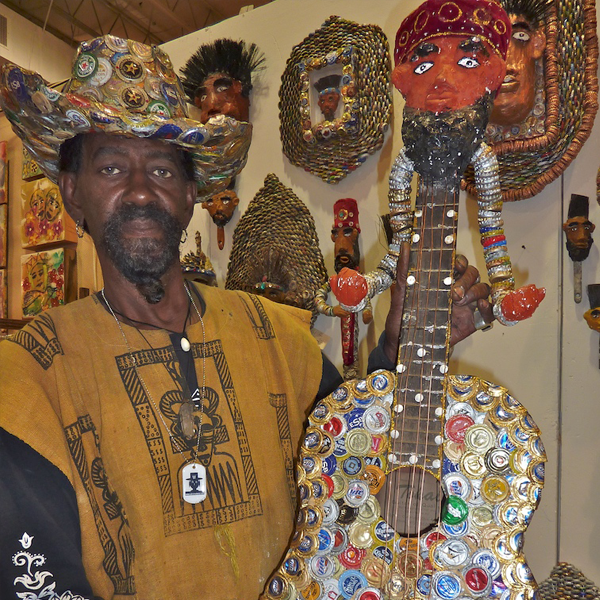 Imagination” Warmack faced the latest in a long line of epic tragedies, when his home and studio in Bethlehem, Penn., caught fire while he was away. By the time he got back, he was met with the blackened remains of a life he’d spent decades building: art made by himself and others, collections of books and artifacts, and the charred and frozen bodies of his dog Pharaoh and several cats. Friends from all over the world responded with benefits and offers of help. But the scale of the loss, and his conviction that some “so-called friends” had stolen work before he got back to town, sent him into a tailspin. His favorite number is three, he says, lining up yet another trio of rescued remains — three charred cans of spray paint — along a porch railing. Past, present and future; life, death, rebirth. His story can be told in three parts, the first and longest in Chicago, where he was born and raised, recovered from a gunshot wound and a coma, and made a name for himself his as a gifted artist and teacher. Industrial sandstone, in which he carved faces, figures and names, was where he started; worldwide fame came courtesy of his bottle-cap creations — giant thrones and mirrors and even a hat and suit of his own clothes. The second starts in 2001, when his brother died. He left Chicago for Pennsylvania, where he built new networks, turned his home-studio into a community arts center and traveled far and wide, teaching workshops and making art. Then that world went up in flames. In the spring of 2009, he moved to Atlanta, certain the city’s rising Phoenix was a sign. Fellow artist and Riverside neighbor Lake Sirmon, who’d known him from Chicago, had been after him to move South. 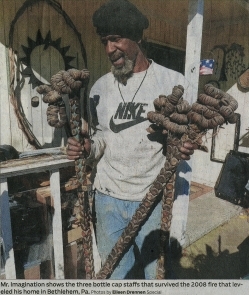 He brought some of the burnt things he’d salvaged and stored the rest. One day, he was able to see the beauty in what survived; see a power in what the fire hadn’t been able to take. Something had shifted. Sirmon’s friend Keith Sharp helped Mr. I find an old house on a large lot not far from the river, where he envisions a new home, with a sculpture garden and lodging for visiting artists. When the rains came a few months later, flooding the house and outbuildings to the tops of their doors, the plan was put on hold. Still, pointing out the place’s possibilities on a recent sunny day, the artist noted with relief a set of deep black burn marks around a window and exhaust fan. Maybe, he joked, it’s fireproofed. Meanwhile, he’s made new roots, led workshops for kids and seniors, and started to work. He’s repaired some of the damaged works, left others in their burnished state, and set about making things he’d never tried before. The art world may think he’s done, he said, given how long he took off from work. But they need to think twice. I have a book about him. I love his work!